I love cooking. I love eating. I love growing food. I keep hens. I’ve got an ever-expanding cookery book collection and the waistline to go with it, a spice rack to die for and an FBI pinny (long story). I worked in broadcasting for much of my life but these days I’m a food and features writer and recipe developer. I’m a home cook: if I want restaurant food I go to restaurants. I can’t multi-task and I have the attention span of a gnat. What I want at home are delicious dishes that don’t take a month of Sundays to prepare, but hopefully ones that are imaginative and appetising. We enjoy a varied range of foods and cuisines, so you’ll find a magnificent jumble of recipes from Britain and from overseas, seafood and meat (including game), soups and salads, jams and pickles, cakes, pies and puddings. You will find butter, cream, sugar, flour and booze in some of my recipes (Mrs Portly, remember?). Although I eat meat, fish and dairy, I also cook and enjoy vegetarian food. Sometimes it’s even vegan, although to be honest that’s usually accidental. We grow a lot of our own fruit and veg and I am a passionate supporter of local producers, because these often small, family-run businesses deserve all the help they can get to stay afloat. Also they rear, grow or make very fine food. I generally eat seasonally because it’s common sense but in winter when all I’ve got left in the garden are brassicas and root crops? Heck, yes, pass me those imported lemons. What I share here is what we actually eat, not just food that’s been styled and prettied up and allowed to get cold. I try my best to make it look attractive but I’m a cook and a writer, not a photographer, so I hope you’ll make allowances. I firmly believe that if you can read a recipe, you can cook. Not everything I make works first time because I’m an inveterate tinkerer, although I promise every recipe here has been repeatedly tried and tested. I mess up so you (hopefully) don’t have to. I see recipes as guidelines, so feel free to adapt to your personal taste, but I’ve tried to be as accurate and specific as possible for people who prefer not to go off piste. Before I go, the ethical bit: very occasionally I’ll be given a free product to try out. If that’s the case it will be clearly stated in the post. I don’t make a habit of this because, without wishing to sound pompous, I try to retain my journalistic objectivity and because this blog is a labour of love and I don’t want to monetise it. I do however labour for lucre elsewhere. 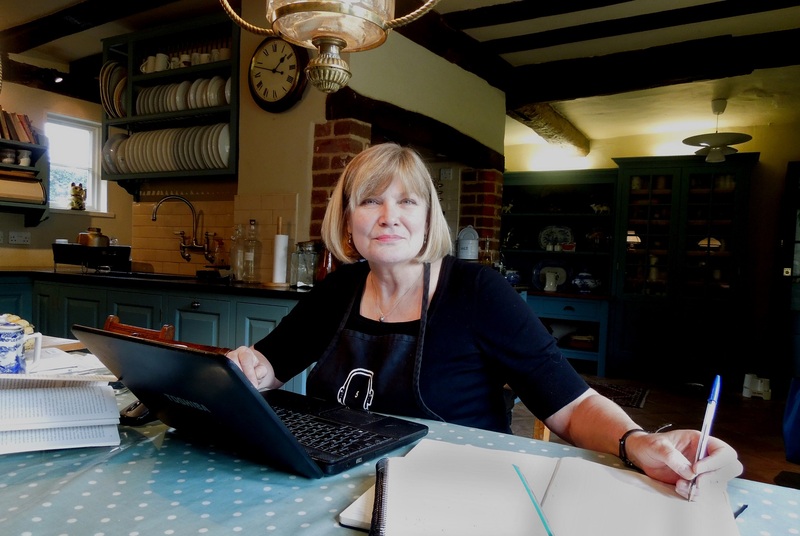 If you’d like to commission me as a food and features writer, recipe developer or event compere, please check out the Ask Mrs Portly page for contact details. You can find my Facebook page here. I’m on Twitter as LindaDuffin and Instagram as linda.duffin. I’m always up for a chat, pop into one or the other and say hello. I have donned my elasticated trousers and am poised with knife and fork! Also suffering from lifestyle envy – and I love the kitchen! Excellent, elasticated trousers a sensible option as am currently planning a recipe for Middle Aged Spread. Hope to see you soon. 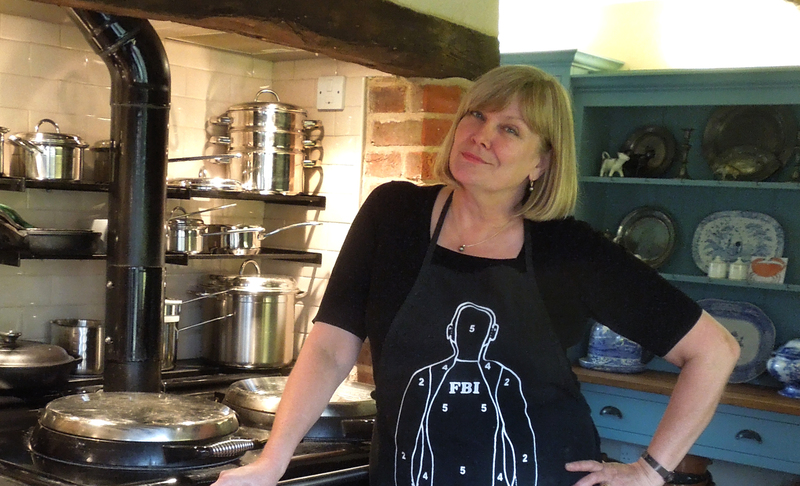 Will wash FBI pinny in your honour. Linda – fabulous website, we love it! Right, let’s try that again under a proper name! What a fabulous blog – we love it. Thank you, I’m glad you like it. Come and visit any time! Dear Mrs Portly, I have just found you on the ‘Huffington Post’. And I am very pleased I did. I have spent a little time today getting to know you and your friends. It has been fun and insteresting. I particularly enjoyed the post ‘Beef & Pigeon Pie’ you may wonder why, well I have neighbours who frequently bring me freshly shot pigeons! I will be using the recipe very soon. Darina Allen, I did know of her through foodie magazines and TV programmes, she really is inspiring. I’m very new to life style/cookery blogs (writing my own) and enjoying finding new ones to follow, to watch and learn. I’m now looking forward to receiving your future posts. Thank you so much for stopping by. I’m really pleased you’ve enjoyed reading the posts – it’s lovely to get feedback – and I look forward to reading yours in my turn. And how lovely to have friends who give you game. I really recommend that Darina recipe and indeed her (very thorough) book. Let me know how you get on if you cook it! Hi there, thanks for the follow. Look forward to swapping ideas! Me too! Will be in touch! I´ve just discovered this blog through Marmaduke Scarlet.Some lovely original recipes I have to say. Mrs Portly, I love your kitchen and your lifestyle. I am one of your friends who would love membrillo as a birthday present as well! I’ve just found your blog via Stefans Gourmet. I’m the one that created the pork dish. I love your blog, it’s like finding a new magazine on the shelf. So much to look and get inspired by. Hi Dave, I loved that dish, it sounded so good. Thanks for the kind comments, very much appreciated. Now that I’ve got some breathing space after Christmas I will return the compliment – I’m really looking forward to checking out your recipes. Thank you, Maha, that’s very kind. I’m glad you like it. Talk soon! Just saw your bit on the Public Broadcasting Station national news here in the U.S. Short but wise comment. Nicely done. Methinks I ‘found’ you at Conor’s and if you are there I’ll follow . . . . well, the waistline may not drop as much as planned in the near future but . . . .
Hi Eha, and thanks very much for the follow. Bring on the elasticated waistbands!